Margaret Richardson (discussion, February 2008) identified this drawing as a companion to drawing 2 both of which relate to drawing 1 by George Dance. 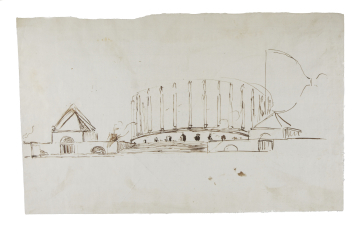 The unfinished drawing of a circular building calls to mind the large roofless drums with engaged columns of Soane's design for a Triumphal Bridge (q.v. ).